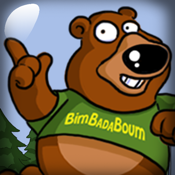 Discover the extraordinary world of Bimbadaboum with a game which is different from the rest! Memory like you’ve never seen it before, with animals from every continent to delight even the smallest of children! Set your memory to work – and that of your children – with the 20 characters that come with every game, along with the extra packs of characters which you can install! The exciting innovation is that you can take photos of your family or your kids themselves and use them in the game. In this way your children can exercise their memory with photos of people they already know. This makes Memory much more educational - and never boring!